We were going to an outdoor concert and trying to decide whether to take a picnic, buy food there, or have an early dinner and enjoy fruit at the picnic; I opted for the final choice as we have a number of upcoming occasions where we will be eating out. My wife claims not to like Mexican food. I had some Good Food brand Mexican Green Sauce in my pantry. 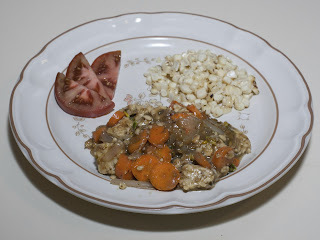 It's a simmer sauce with tomatillas, water, onions, canola oil (therefore almost no added fat - the sauce only contributes a gram of fat per 2T sauce, and I used maybe 5T of the sauce for the whole dish), poblano and jalapeno peppers, chiles, garlic, and a few other ingredients. I made a simple dish with cooking in my saute pan with no added fat onion, tempeh, and carrot, then simmering in the sauce. I had some corn-off-the-cob and put in just a little Earth Balance margarine, a touch of salt, and a little lime juice. Tomato slices finished off the plate. I didn't serve this (slightly) spicy dish to my preschooler, but my wife and I enjoyed it. My wife is open to my making a Mexican-style tortilla dish with this sauce as an ingredient, and I hope to do that in the coming days. My Dad has been visiting with us for a few weeks and has dental problems that have left him largely unable to chew. 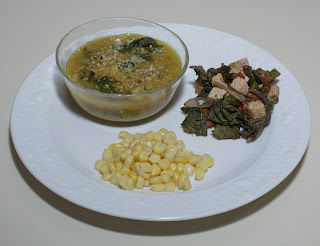 He wanted a very soft lentil soup; my wife was wanting to only eat a light soup, so I prepared a red lentil dhal for them and combined it with leftovers and corn for my preschooler and me. I put ample water in with red lentils to make sure that I had a very soft result. I also put some kale leaves and a little onion in; my Dad doesn't eat garlic, so I didn't include a vegan bouillon cube. Red lentils cook quickly, in about 15m. For softness, I cooked for about 20m. Everybody was happy with dinner! I rarely cook with short-grained "sticky" rices, but yesterday at Whole Foods Market, I bought some "Jade Pearl" rice, a rice infused with bamboo that cooks in a 1 to 1 1/2 ratio rice to water in 20 minutes. My wife and daughter are back (yay! ), and I thought tonight of making a dish with this rice. I put rice and water into a stainless steel pan in a ratio of one part rice to one and a half part water. I think that I used about 2/3 cup rice and 1 cup water; the quantity was about right for two medium or large servings (I thought there might be some leftover, but it was too good to leave any!). I had intended to include a vegan bouillon cube but forgot - I added that part way into the cooking when I remembered. I brought the mixture to a boil. I took three leaves of red kale and hand stripped about 1 1/2" squares of leaf from the stems. I added the kale to the pan. I also added one garlic clove, finely chopped, and about 4 ounces of tempeh, cut into 3/8" cubes. I covered the pan and reduced heat to low; I let the rice-vegetable mixture simmer for about 20 minutes, and served. It was surprisingly creamy and tasty! 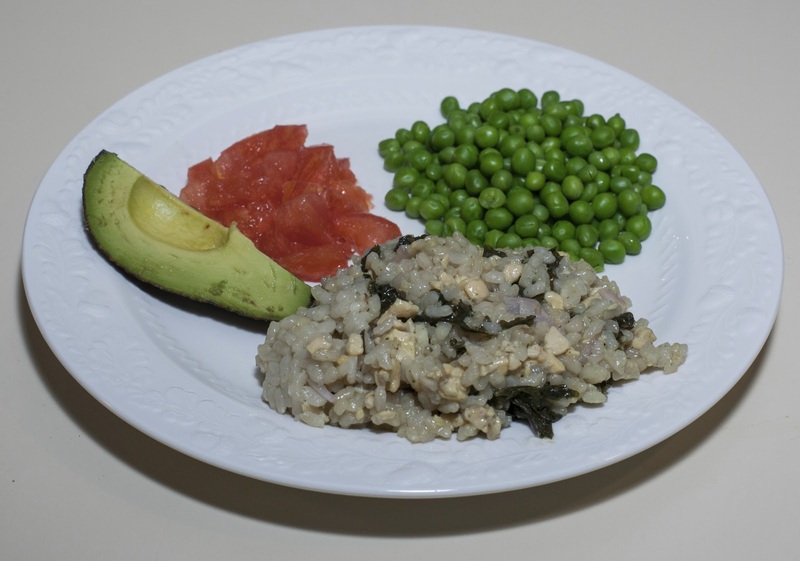 I served with some avocado and tomato, as well as some peas. I have been a vegan for a number of years now and love the wide variety of plant-based foods that are so tasty. I do occasionally eat a vegan cheese, particularly a raw nut cheese or prepared Daiya cheese. When I was shopping today, I found that Daiya now has Swiss-style slices! Many years ago, I would enjoy melting Swiss cheese on an open-faced sandwich, and thought that I would try that tonight. I got a sweet potato baking. I love Japanese sweet potatoes - they are purple on the outside and off-white inside. The smell a bit like perfume when they are cooked and cut open! I then got to work in preparing the main course. This is the last night of my cooking for myself; my wife doesn't eat tofu but I happened to have some at home, so used it in tonight's meal. I cut a shallot into thick 3/8" slices and put them in my Saladmaster stainless steel saute pan. I turned the heat on to medium and started cooking the shallot; after about 3 minutes or so when the shallot was turning a bit clear, I added about a fifth of a block of tofu cut into 1/2" cubes and continued cooking for a few more minutes till the tofu was warmed and some cubes starting to brown. I then added hand-torn approximately 2" square kale leaves, sans stem, from both lacinato and red kale varieties, using maybe 3 leaves of each kind. I also put in a small roasted red bell pepper that I had sliced into 3/8" widths. The dish was ready in a few minutes, when I added just a touch of salt. I had a baguette that I lightly toasted. I put half of a slice of the Swiss "cheese" atop either half and put the bread back in the toaster oven. I watched it toasting; within a minute or so, the "cheese" was bubbling and becoming brown. I served the toasted baguette with a few drops of hot sauce and a little bit of tomato. The verdict? Dinner was quite good, especially the kale. The "cheese"? As much as I like other Daiya products, this one was acceptable but didn't have a lot of flavor. I was happy to see how it browned and melted so easily, but it has very pungency. I thought that for a few days while my wife and daughter are away that I might make some "repeats" but I created another brand new dish - I'll have to make it for her, as I quite liked it. It was an almost no-added-fat dinner; I put maybe 1/2 teaspoon of Earth Balance margarine (about a gram or two of fat), along with lime juice and a dash of salt to a baked potato. 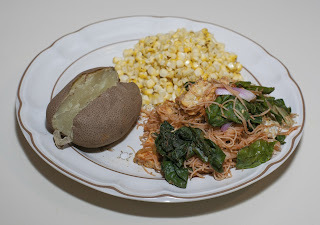 For the main course, I used maifun (brown rice) noodles. In my Saladmaster stainless steel-titanium saute pan, I started cooking on medium heat with no added fat or liquid some onion; after a minute or two, I added 1" x 1" x 1/4" cubes of tempeh. After another 3 or 4 minutes, when the tempeh was showing a little browning, I added hand stripped kale, leaving the stem behind, from about 5 leaves, as well as about 3/4 teaspoon of red curry paste and about 1/4 cup of water. I had soaked about 3/4 cup of the noodles; now I drained them and added them to the saute, as well. My wife and daughter are off for a few days; I dropped them off for their trip and got home late. One of my classes that I teach on Gandhian non-violence ended on Tuesday. We went out that evening for a class dinner at one of my favorite restaurants, Vimala's Curryblossom Cafe, and brought home leftovers of her tasty food, including dhal and brown basmati rice, which I used tonight. We make our own uttapam (South Indian crepe made of rice and lentils). 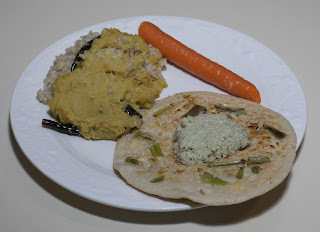 Since we had some batter, I made an uttapam and topped it with coconut chutney from Vimala's. It was a fast and quality meal. In the Saladmaster stainless steel saute pan that I use frequently, I added three locally grown purple spring onions cut into quarters then 1 1/4" long slices. I turned the pan on medium high with no added fat or broth or other liquid, and stirred occasionally. As the onion cooked, after about 3 minutes I addd a half dozen shiitake mushrooms, halved, and continued stirring periodially. I added all of a 16 ounce package of frozen cubed butternut squash about two minutes later, as the mushroom cooked down a bit. I continued to periodically stir. 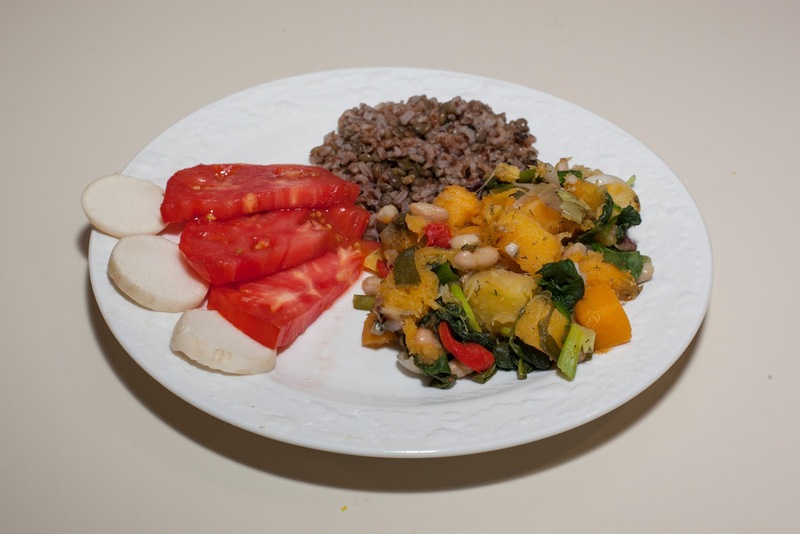 As the squash defrosted and warmed up, after maybe 5-6 minutes, I added a cup and a half or so of baby spinach leaves, maybe 6 ounces of canellini beans, and a roasted red bell pepper, cut into 1" lengths and maybe 1/4" widths. I like adding onion at different points of a saute to get different mouth feels. I took two scallions, cut into 1" lengths, and added them as well at this point. I continued periodically stirring; after about 2 or 3 minutes, the spinach nicely cooked down, and I added a pinch or two of salt, and maybe a quarter teaspoon of dill. That's it! I served it with the leftover Madagascar Pink - French Lentil combination from yesterday (I added some water and heated it gently in a covered pan for 6 of 7 minutes), and some tomato and turnip slices. Dinner was healthful and tasty! My wife enjoys my cooking but wants me to prepare meals faster; it usually takes me 45m to 1 1/2 hours, and she doesn't like to wait. She asked me to make dinner in 10 minutes today, and I tried, but actually took 11 minutes. I "cheated" a bit by picking up a prepared spicy black bean salad from Whole Foods. I cooked some quinoa with a vegan bouillon cube and put that down on the plate as a base. I served the black bean salad on top. 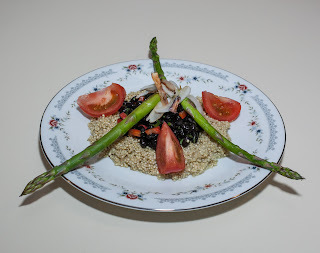 While the quinoa was cooking, I grilled asparagus and thick half moons of sweet onion. After drizzling some fresh squeezed tangerine juice and sprinkling on a little salt, I served the asparagus and onion on top, along with wedges of tomato. Dinner was reasonable, though one minute late, alas! 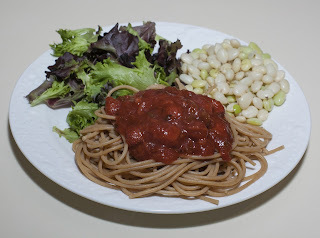 The experiment with using strawberries in a tomato sauce that I tried on May 4th was a success, so I want to try other ways of using such a sauce, which I'll call "strawberry marinara". Tonight, we came back with over twenty-three pounds of organic, biodynamic strawberries from Whitted-Bowers Farm. A friend had gone picking with us, and her boyfriend was coming to meet her once we got back home, so I put together a late dinner for all of us. Sliced six medium dehulled strawberries into halves, and put them in the pan. Over medium heat, I cooked, stirring, a few minutes till the strawberries were cooked down and jam-like. I added about a half cup of a prepared marinara sauce and another six medium dehulled halved strawberries, as well as about 3 tablespoons of large 1/2" cubed onion and a quarter red bell pepper, cut into 3/8" cubes. I cooked another 3 or 4 minutes till the new batch of strawberry was cooked down to jam consistency. I put in about a third of a medium Vidalia onion cut into 3/8" thick half moons and turned the heat on to medium-high. I sauteed (with no oil, water, or broth) by stirring for a minute or two, then added an 8 ounce box of seitan strips. I continued stirring for about 5-7 minutes till the onion was slightly carmelized and the seitan lightly browned. I then added the strawberry marinara, as well as a light sprinkle of salt and 1/2 teaspoon of dried oregano. If I weren't rushing to make this meal, I'd have added some fresh herbs as well just before serving the meal. I also added about a half dozen stalks of asparagus cut into 1" lengths. I mixed all the ingredients and let them simmer on low heat for a few minutes, then served. In a medium stock pot 3/4 filled with water, I added a vegan bouillon cube and brought the broth to a boil. I put in a cup or so of orzo into the pot and let it cook about nine minutes, as the package indicated, till the orzo was al dente. While it was cooking, I made a quick miso sauce. I put into my VitaMix blender a chunk of peeled ginger (maybe a 1/2" cube), a tablespoon of miso, and a quarter cup of water. I blended just a few seconds till liquified. Once the orzo was done, I mixed in the sauce, as well as just a little bit of 1/4" cubed onion (maybe 3 tablespoons). I also added some fennel root (about a tablespoon of the root, cut into small 1/8" cubes) and a little bit (maybe a tablespoon) of fennel greens cut into 1/2" lengths. I added two tablespoons of nutritional yeast, mixed, and served. I served this with a simple salad of cucumber slices topped with lemon juice and hemp seeds. It was tasty! Yesterday was the first day for pick-your-own strawberries at Whitted-Bowers Farm about 50 minutes away from us. My wife is more careful with buying organic than I am, but we both insist on only organic berries, and this lovely farm is not only organic, but also biodynamic. When we first discovered the farm two years ago, we came back with something like 75 pounds of strawberries in three visits! Yesterday it was just my daughter and me, and we picked about 12 1/2 pounds. Several varieties were almost ready, but our favorite, 'Early Glow' was the only one really ready, and all that we picked. We froze about half of what we picked and are dehydrating most of the rest (strawberry chips, just dehydrated strawberry slices, last and have a nice and concentrated flavor). I wanted to use some in a main course, and was thinking of making some dressing like I did after the first visit to this farm (and should have tonight, but ran out of time), but also did a little bit of research on the web and found an interesting sounding and easy recipe that used strawberries cooked down with tomato puree to make a pasta sauce - I don't think I'd ever have thought of that! Hats off to Chefs Ron Suhanosky and Colleen Marnell-Suhanosky (formerly) of New York City's Lexington Ave.'s Sfoglia restaurant who came up with this recipe for Spaghetti With Strawberries. Their premise is that, just as some pastry chefs are adding savory ingredients, why not add sweet to main courses? I think they're on to something, and used their approach, with some changes. Their sauce turned out surprisingly good; we all loved it and the dinner in general, and I will continue to use this as an inspiration for additional creations! Here is what I did. It is an easy recipe, in spite of how I have described it! I took about six-ten ripe medium strawberries (the original recipe calls for 1/2 pound), washed and dehulled them, and cut them in half. I put the berries in a stainless steel sauce pan and, with no added oil or anything else, gently heated on medium heat, stirring (my daughter actually helped and did the stirring!). After just a minute or so, the strawberry began releasing juice; I added a tablespoonful or so of ume plum vinegar. Over the course of about 4 or 5 minutes, the strawberry largely liquified and cooked down to almost half the original volume. (I didn't think that the vinegar was necessary and next time I make such a sauce, I'll skip it). The original recipe calls for then adding a cup of tomato puree; instead, I used almost 2 cups of an organic marinara sauce. I also added another batch of six-ten ripe strawberries, but did not add 4 ounces of reserved pasta cooking water (I preferred more tomato and a thicker sauce, and am glad I did), as the recipe called for. 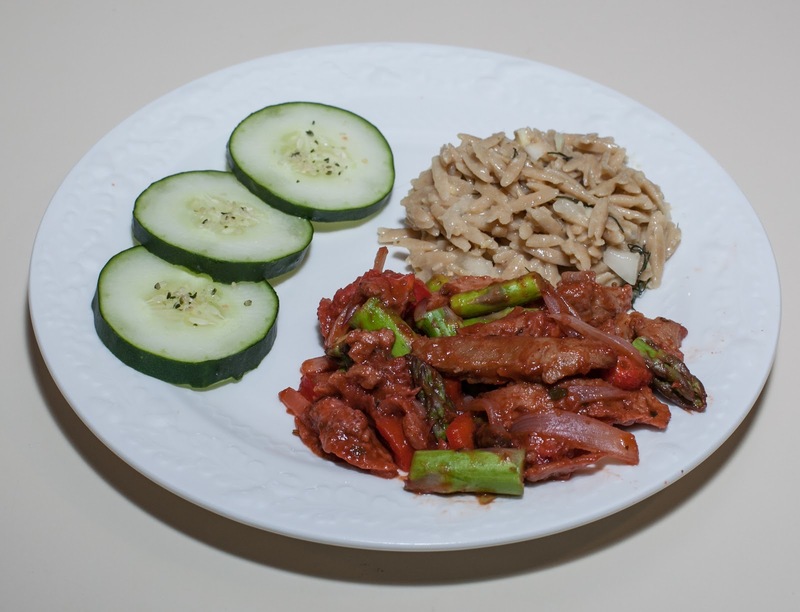 I thought it would be good to also add some vegetables at this point, and added about a quarter small bell pepper, cut into approximately 3/8" cubes, as well as about an eighth of a small yellow onion, cut into 1/4" cubes. Next time, I may also add some kale leaves, perhaps cut into chiffonades, as well as quartered basil leaves. Some cubed carrot would also be good! My daughter continued to stir for another 5 minutes or so till the strawberry was again much softened and almost liquified; the recipe says that one should reduce the sauce in half again, and I think it did, if just the strawberry was considered. The recipe concludes with seasoning the sauce to taste. What I did was add a little bit of salt to taste (1/2 teaspoonful I believe), a few shakes of dried oregano, and maybe ten fresh lemon sage leaves. 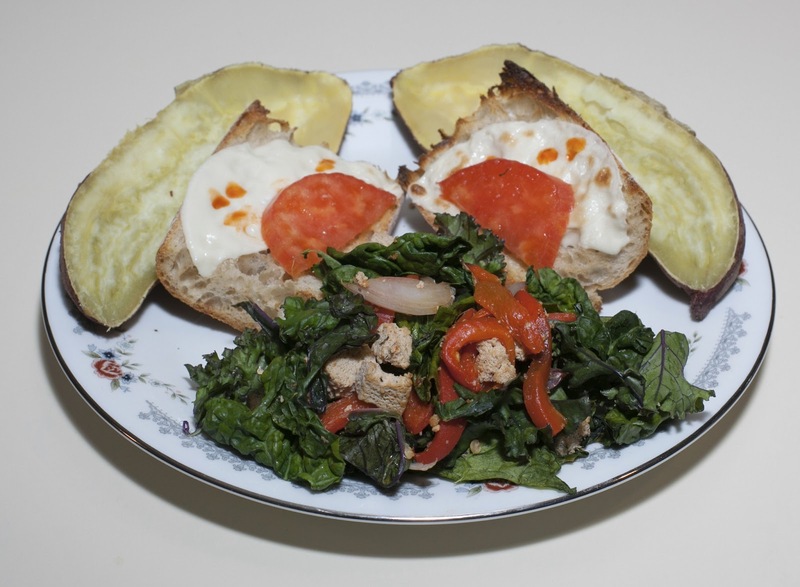 I wanted to also add nutritional yeast, but decided to keep the sauce more pure strawberry-tomato to appreciate what Chefs Suhanosky and Marnell-Suhanosky intended, and next time build more of my own vision into the sauce. In parallel, I had prepared whole wheat spaghetti, onto which I served the sauce. I had wanted to mix some hot chili powder into the cooking sauce, but instead tried some at the table atop the sauce (nowadays I rarely strongly season, as my daughter won't eat something that is too spicy). Here my intuition was off; surprisingly, at least to my taste, this tomato sauce does not do well with heat. The sauce really was good and was not something that I would have predicted. I hope soon to make pizza with a strawberry sauce as a base! I will experiment with other ways of cooking strawberries into tomato sauces. A basic mixed green salad and butter peas (purchased frozen and similar to lima beans and black-eyed peas) completed the dinner. I had hoped to make a version of a simple strawberry cobbler with reduced fat and sugar, as well, but a simple strawberry-Valencia orange juice to accompany the meal sufficed. Except for a little bit of olive oil (1g of fat per serving of sauce, and I think that was 1/6 of the sauce; I used almost 1/3, so that totals 2g of fat for all three of us, or about 2/3 g fat per serving) that was in the tomato sauce that I used, it was another no-added-fat dinner. Because it's such a small amount and because any tomato sauce can be used, I am still labeling the dish as "no added fat".